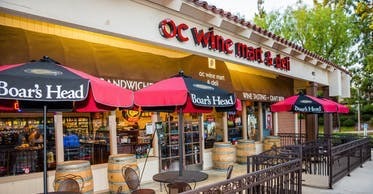 OC Wine Mart is an upscale gourmet market and deli with a great selection of wine and craft beer. We have a tasting panel who tastes everything before we put it on our shelves. We believe a good wine is a wine you like, therefore we installed the Self-Serve Wine Bar system so you can taste before you buy. Our atmosphere is casual and relaxed, akin to a “Starbucks” for wine. Why travel to wine country when you can have a premier wine tasting experience right here in your backyard? We have the largest self-serve selection in Orange County, with 40 wines on tap in Aliso Viejo and 32 wines in our Yorba Linda location. You are bound to find that perfect wine! We recently just added Craft Beer on Tap at our Aliso store. Though we currently only have 6 taps, we often rotate them among our favorite local breweries. We offer gourmet sandwiches made with Boar’s Head meats and cheeses and artisan bread from OC Baking Company. We also offer live music on Thursdays, Fridays, and Saturdays from 6:30-9pm. Our Wine Bar Menu feature our Artisan Cheese & Meat Platters, Flatbreads, Caprese Salad, Olives, and Bruschetta. These delicious tapas pair perfectly with wine and will enhance your wine tasting experience. OC Wine Mart specializes in corporate gifting, custom gift baskets, and a delivery service, making it the ideal place for holiday gifting. We also cater wine & artisan cheese and upscale wine tasting events at various venues and at both our locations.